These early Christians were the first persecuted in mass by the Emperor Nero in the year 64 A.D., before the martyrdom of Saints Peter and Paul. Nero was widely believed to have caused the fire that burned down much of Rome in that same year. He blamed the fire on Christians and put them to death, many by crucifixion, being fed to the wild animals in the circus, or by being tied to posts and lit up as human torches. These Holy martyrs were called the “Disciples of the Apostles” and their firmness in the face of their gruesome deaths were a powerful testimony that led to many conversions in the early Roman Church. These were all early Christians in Rome within a dozen or so years after the death of Jesus, though they were not the converts of the “Apostle of the Gentiles” Romans 15:20. Paul had not yet visited them at the time he wrote his great letter in 57-58 A.D. There was a large Jewish population in Rome. Probably as a result of Controversy between Jews and Jewish Christians, the Emperor expelled all Jews from Rome in 49-50 A.D. Historians tell us that the expulsion was due to disturbances in the city, “Caused by certain Christians”. It is believed that many came back after the Emperor’s death in 54 A.D., because Paul’s letter was addressed to a Church with members from Jewish and Gentile backgrounds. In July of 64 A.D., more than half of Rome was destroyed by fire. Rumor blamed the tragedy on Nero, who wanted to enlarge his palace. He shifted the blame by accusing the Christians. 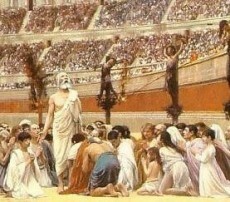 According to the Historian Tacitus, many Christians were put to death because of their “hatred of the human race”. Peter and Paul were probably among the victims of this time. Eventually Nero was threatened by an army revolt and condemned to death by the senate, and committed suicide in 68 A.D. at the age of 31 because of these, the first of Christian martyrs being falsely blamed. Wherever the Good News of Jesus was preached, it met the same opposition as Jesus did, and many of those who began to follow him shared his sufferings and death. Notice how no human force could stop the Spirit unleashed upon the world through the Christians? They only became stronger witnesses to the faith. Pope Clement I, third successor of St. Peter writes, “It was through envy and jealousy that the greatest and most upright pillars of the church were persecuted and struggled unto death… First of all, Peter whom because of unreasonable jealousy suffered not merely once or twice, but many times, and, having thus given his witness, went to the place of glory that he deserved. It was through jealousy and conflict that Paul showed the way to the prize for perseverance. He was put in chains seven times, sent into exile, and stoned; a herald both in the east and the west, he achieved a noble fame by his faith.” We too, can follow the examples of the Great Saints that went before us, paving the way of our faith that has stood the many centuries of time. Don’t forget to call upon the First Holy Martyrs of the Holy Roman Church on this their Feast Day – as they are always willing to help us, if only we call upon them for assistance.